In the Walker Primary School, children are given the tools and the space to develop the self-confidence and self-esteem that will ensure that their first steps on the path of discovery lead to a lifetime of learning and success. Each self-contained class studies language arts, reading, handwriting, math, science, social studies, and character education. Special area teachers also provide science, art, computer, music, physical education, library, and Spanish for preschoolers. Our Primary School students share the same rotating schedule as the older students in Lower, Middle, and Upper School. Not only does this acclimate them to the rigors of academic life, it makes it easier for them to interact with students at other levels. Eighth graders often read to the kindergarteners, and seniors will meet them for a science class or play session on the playground. Classes are held five days a week with several options. Depending on your tuition choice, you may bring your child as early as 7:00 a.m. and she or he may stay at school in our extended day program until 6:00 p.m.
Our language curriculum is individualized for each child's needs and focuses on early literacy behaviors. Students are encouraged to express their own ideas through drawing pictures, writing random letter strings, labeling their creations with words, and completing sentences. The science curriculum encourages students to make observations and challenges them to find creative and resourceful methods for processing new information. 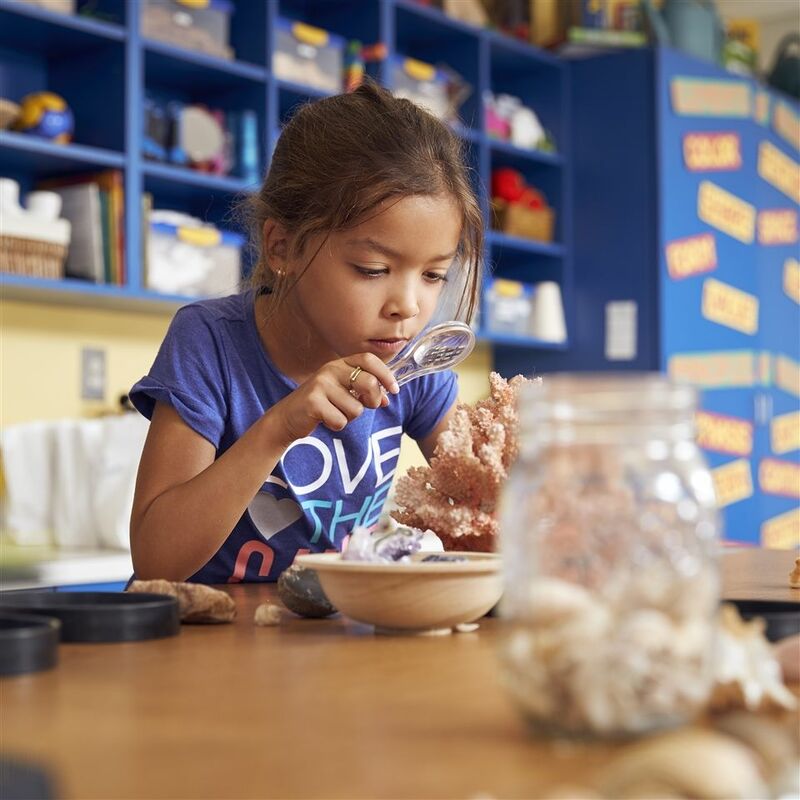 Through investigation, inquiry, and experimentation, students develop the skills to both ask and answer questions about the world around them. Hands-on math activities and games help develop a strong number sense while providing a foundation for use of the Math in Focus curriculum. Students of all ages work to hone skills like number and shape recognition, sorting, patterning, and basic computation.